Guests of Dans Florida Condos, not only visit Anna Maria Island FL for the world class beaches, relaxation, or the sun. . . they often come for healthy and tasty cuisine. While fresh fish is available in pretty much every resturant and diner you turn, how do you know you are receiving the best quality catch of the day fish that the Island is famous for. Guests of Dans Florida Condos have been dining at the Beach House for decades. They not only have premier real estate with sunset views and elegant dinning, but they support sustainable fishing practices and have a long reputation of delivering fresh, quality meals night in and night out. 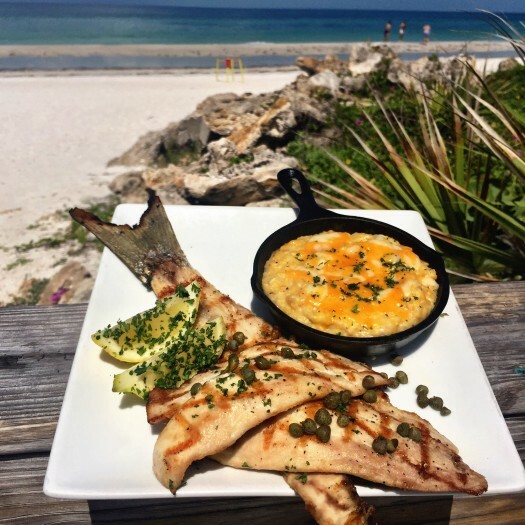 At the Beach House, they wholeheartedly support sustainable fishing practices. That means your favorite seafood species has its best chance to be around for you and your children to enjoy in the future. When it comes to seafood, the term “sustainable” means that a species has been wild caught or farmed with both the long-term future of the fishery and the health of the oceans as top priorities. When you look at the Beach House menu and see Atlantic Cod, you know it has received numerous recommendations for being sustainable and good for you. They also use local fisheries for fish like Cortez Grey Striped mullet and other underutilized species that have met the recommendations for certified, sustainable fishing. The news isn’t all bad as there is something that can be done. For instance, the Gulf Red Snapper fishery was driven to the brink of collapse by decades of overfishing. According to the Environmental Defense Fund, cooperation in the fishing industry has led to a noteworthy change in the amount of snapper available for harvesting. Since 2007 the amount of stock has tripled and now can be found on menus year round and is recognized as a sustainable choice for seafood. Eating sustainably doesn’t mean that you have to sacrifice flavor or texture. Many lesser known species are absolutely delicious on their own and our culinary team is well versed on the best ways to enhance the flavors of each species, allowing us to bring diversity to our menus and support a healthy, sustainable environment. Know that at the Beach House they take commitment to the health and sustainability of the ocean as seriously as their commitment to customers. It has always been their aim to be good stewards of the environment and to leave it better than we found it. *Please note – Dans Florida Condos posts blogs of local establishments and events periodically, for the intended benefit of our guests and visitors of Anna Maria Island. We do not receive advertisement commissions or other compensation from these posts. These recommendations are either experienced firsthand by us, or via reputable friends and partners on the Island. This ensures we are informing our guests of the “best of the best” that the Anna Maria Island and the surrounding areas have to offer. *The content of this blog is not to be copied, adapted or shared without the written consent of Dans Florida Condos . ← Anna Maria Island – Voted 6th Happiest Seaside Town in U.S. Contact Me Now! I bet you'll be surprised how quickly I respond to your inquiry, go ahead time me! Hi, I am Dan. If you are anything like me, once you visit Anna Maria Island, you won’t want to leave. Copyright © 2019 Dans Florida Condos. Powered by WordPress. Theme: Accelerate by ThemeGrill.